All operators are required to comply with specific airplane performance limitations that govern approach and landing. Many of these requirements must be considered prior to the origination of flight. The primary goal of these performance considerations is to ensure that the aircraft can remain clear of obstructions throughout the approach, landing, and go-around phase of flight, as well as land within the distance required by the FAA. Although the majority of in-depth performance planning for an instrument flight is normally done prior to the aircraft’s departure, a general review of performance considerations is usually conducted prior to commencing an instrument approach. Land within the distance required by the regulations. Climb from the missed approach point (MAP) and maintain a specified climb gradient with one engine inoperative. Perform a go-around from the final stage of landing and maintain a specified climb gradient with all engines operating and the aircraft in the landing configuration. Many airplanes have more than one allowable flap configuration for normal landing. Often, a reduced flap setting for landing allows the airplane to operate at a higher landing weight into a field that has restrictive obstacles in the missed approach or rejected landing climb path. On these occasions, the full-flap landing speed may not allow the airplane enough energy to successfully complete a go-around and avoid any high terrain and/or obstacles that might exist on the climb out. Therefore, all-engine and engine-out missed approaches, as well as rejected landings, must be taken into consideration in compliance with the regulations. Note: Helicopter pilots may use the Category A line of minimums provided the helicopter is operated at Category A airspeeds. An airplane is certified in only one approach category, and although a faster approach may require higher category minimums to be used, an airplane cannot be flown to the minimums of a slower approach category. The certified approach category is permanent and independent of the changing conditions of day-to-day operations. From a TERPS viewpoint, the importance of a pilot not operating an aircraft at a category line of minimums lower than the aircraft is certified for is primarily the margin of protection provided for containment of the aircraft within the procedure design for a slower aircraft. This includes height loss at the decision altitude, missed approach climb surface, and turn containment in the missed approach at the higher category speeds. Pilots are responsible for determining if a higher approach category applies. If a faster approach speed is used that places the aircraft in a higher approach category, the minimums for the appropriate higher category must be used. Emergency returns at weights in excess of maximum certificated landing weight, approaches made with inoperative flaps, and approaches made in icing conditions for some airplanes are examples of situations that can necessitate the use of higher approach category minima. Circling approaches are one of the most challenging flight maneuvers conducted in the NAS, especially for pilots of CAT C and CAT D turbine-powered, transport category airplanes. These maneuvers are conducted at low altitude, day and night, and often with precipitation present affecting visibility, depth perception, and the ability to adequately assess the descent profile to the landing runway. Most often, circling approaches are conducted to runways without the benefit of electronic navigation aids to support the descent from the Circling Minimums Decision Altitude (CMDA) to the runway. Circling approaches conducted at faster-than-normal, straight-in approach speeds also require a pilot to consider the larger circling approach area, since published circling minimums provide obstacle clearance only within the appropriate area of protection and is based on the approach category speed. 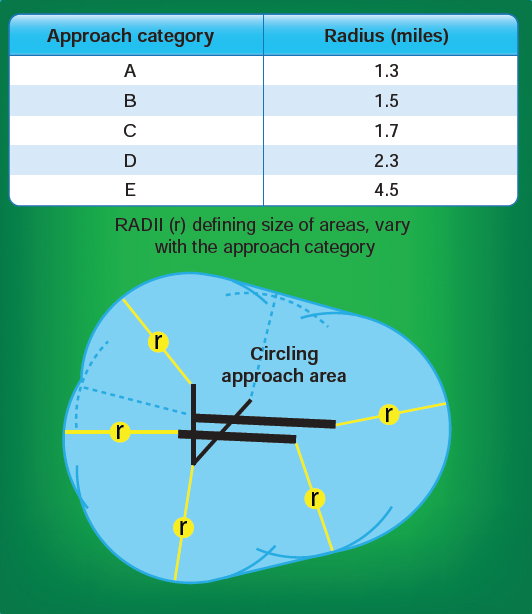 [Figure 4-2] The circling approach area is the obstacle clearance area for aircraft maneuvering to land on a runway that does not meet the criteria for a straight- in approach. The size of the circling area varies with the approach category of the aircraft, as shown in Figure 4-2. Figure 4-2. Construction of circling approach area. A minimum of 300 feet of obstacle clearance is provided in the circling segment. Pilots should remain at or above the circling altitude until the aircraft is continuously in a position from which a descent to a landing on the intended runway can be made at a normal rate of descent and using normal maneuvers. Since an approach category can make a difference in the approach and weather minimums and, in some cases, prohibit flight crews from initiating an approach, the approach speed should be calculated and the effects on the approach determined and briefed in the preflight planning phase, as well as reviewed prior to commencing an approach. Prior to FAA Order 8260.3 Change 21, pilots were often faced with the challenge of descending using a stabilized approach concept if the CMDA height above airport (HAA) exceeded 1,200 feet. Once the HAA approached 1,200 feet, pilots were often forced to increase their rates of descent in order to arrive at the appropriate “in-slot” position. “In-slot” being defined as at a minimum, a CAT C or CAT D turbine-powered airplane should be wings level on a three degree – 318 ft/NM descent path not less than 1 NM from the touchdown point (1,000 feet beyond runway threshold). This was due to the small size of the circling protected airspace that the aircrews must remain within to ensure obstacle clearance. The FAA Order 8260.3 Change 21 to the circling protected airspace afforded much greater obstacle protection. However, it also afforded the pilot the opportunity to use the extra protected airspace to mitigate the need to conduct a high descent rate, unstabilized approach that was often necessary as a result of the previous criteria for the Circling Approach Radius (CAR). For example, under FAA Order 8260.3 Change 21, a sea level airport with a 1,500 ft HAA will have CAT C CAR of 2.86 NM, a 1.16 NM (68.5%) increase over pre-Change 21 CAR for CAT C. This extra protected airspace can be used by the pilot to maneuver the aircraft instead of being forced to use high descent rates which are often necessary for high HAA circling approaches. Most commercial operators dictate standard procedures for conducting instrument approaches in their FAA-approved manuals. These standards designate company callouts, flight profiles, configurations, and other specific duties for each flight deck crewmember during the conduct of an instrument approach.